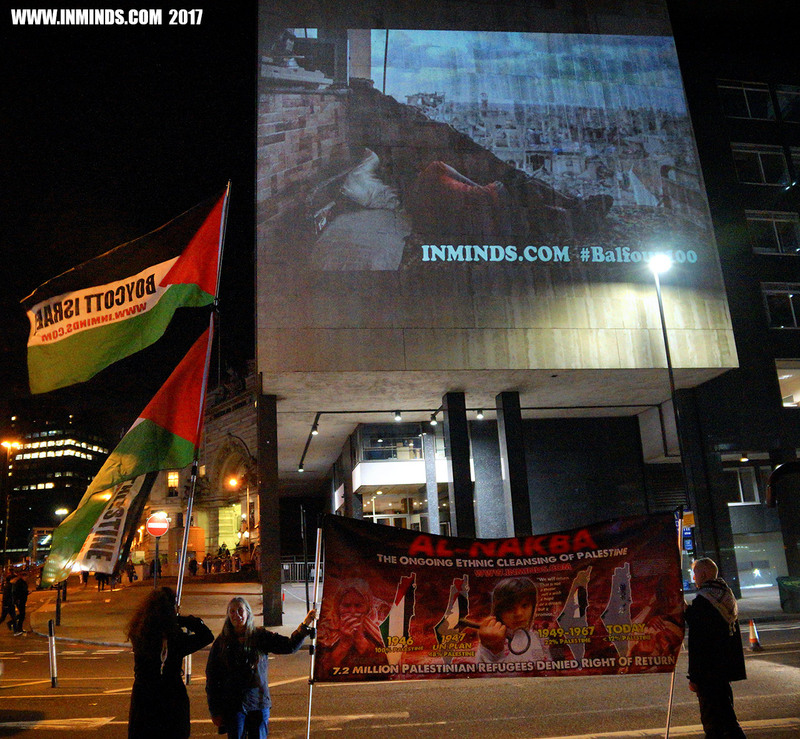 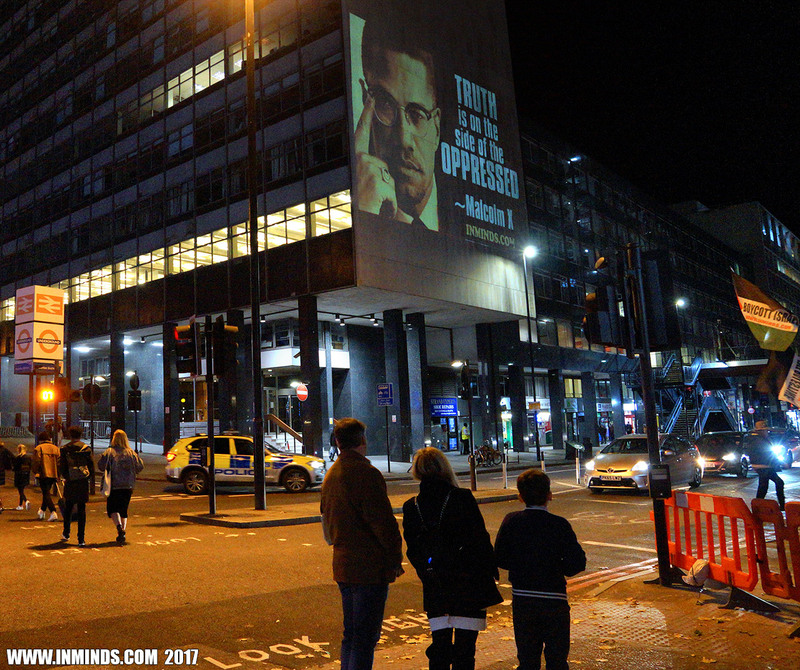 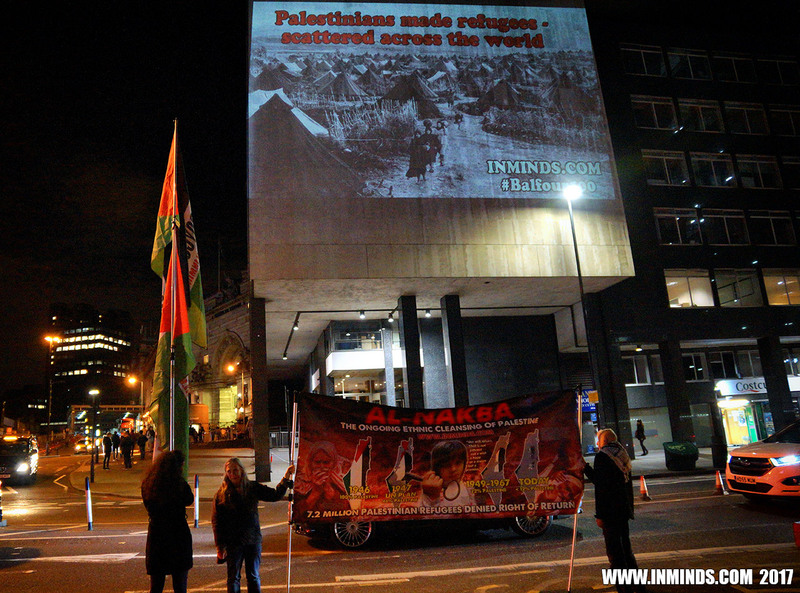 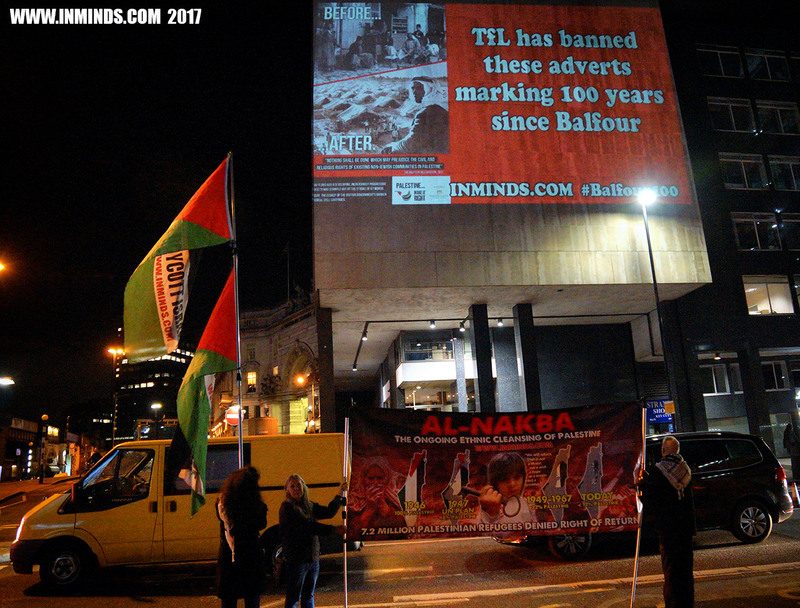 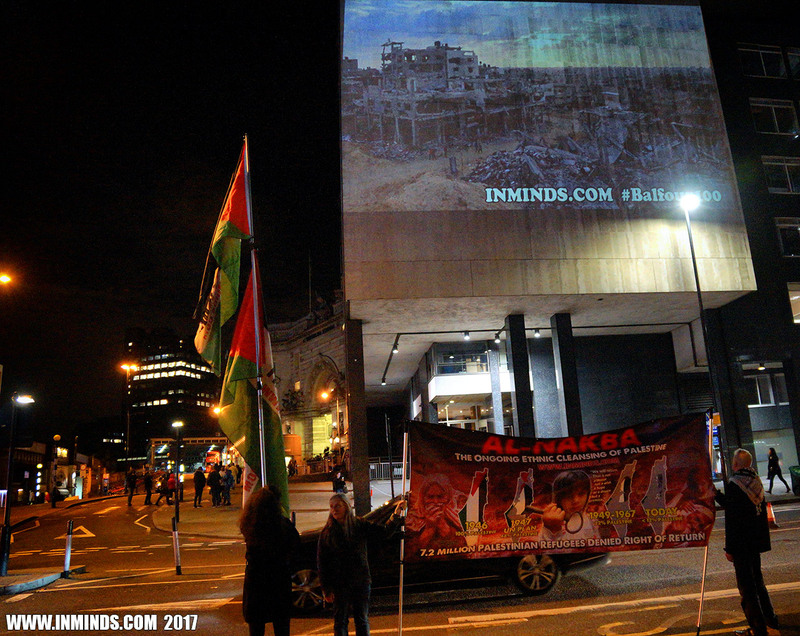 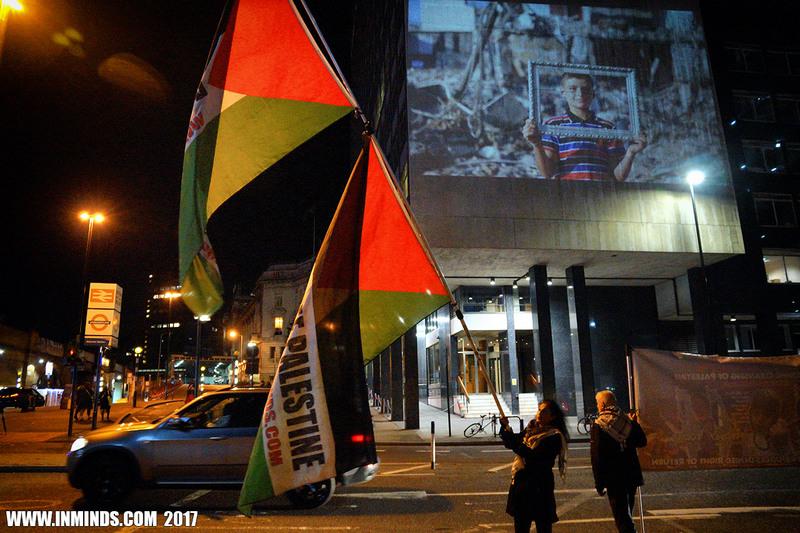 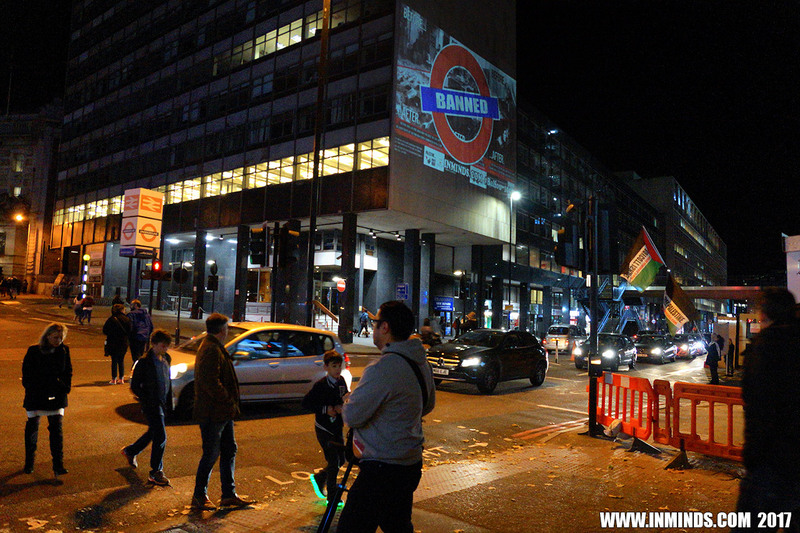 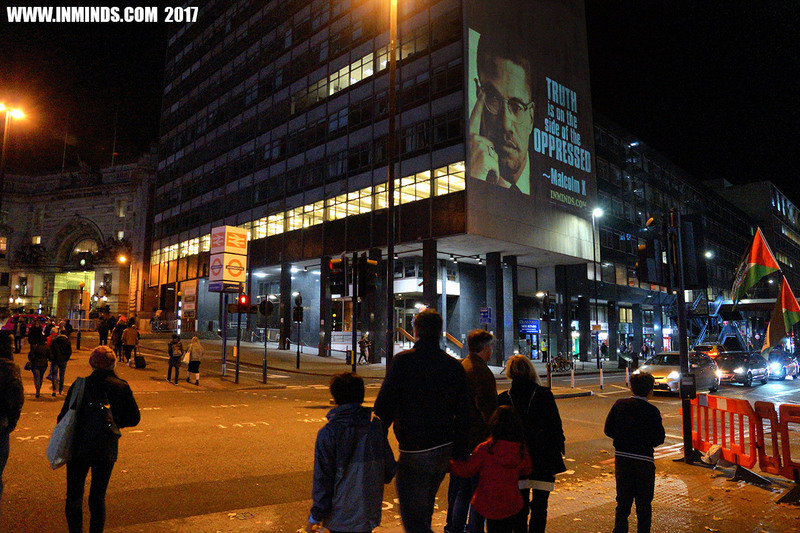 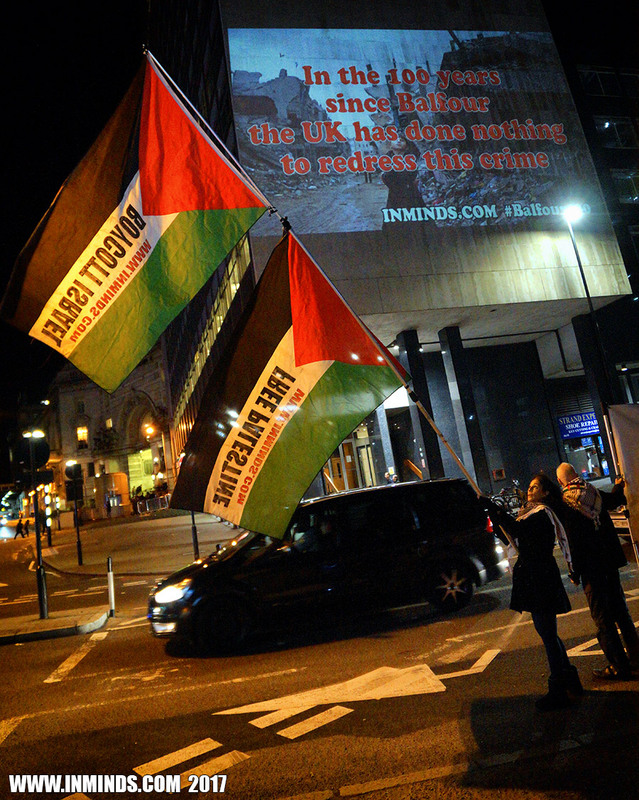 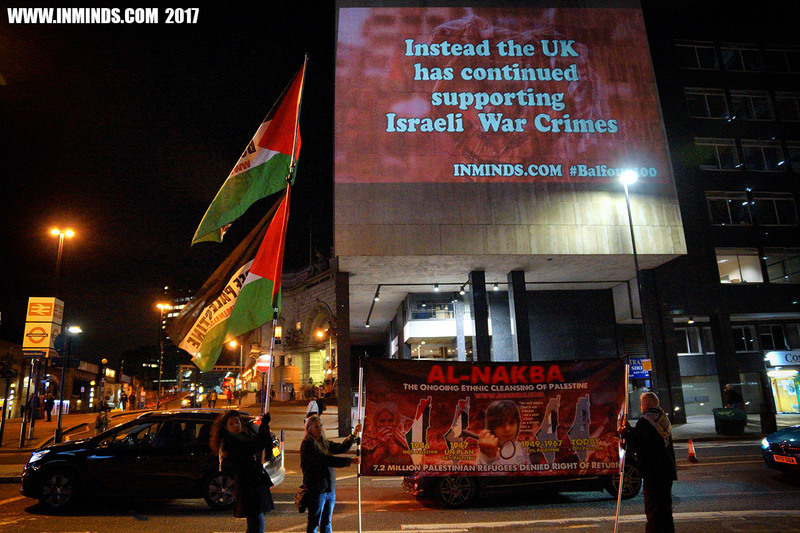 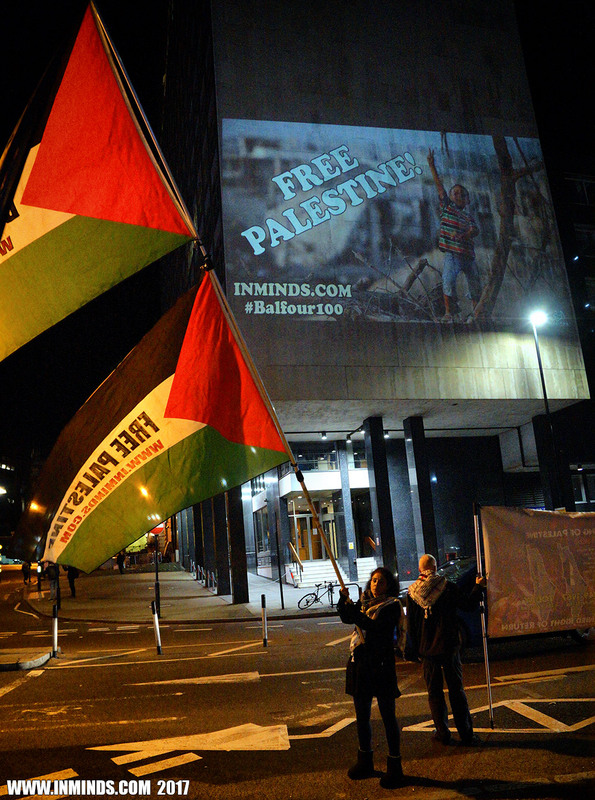 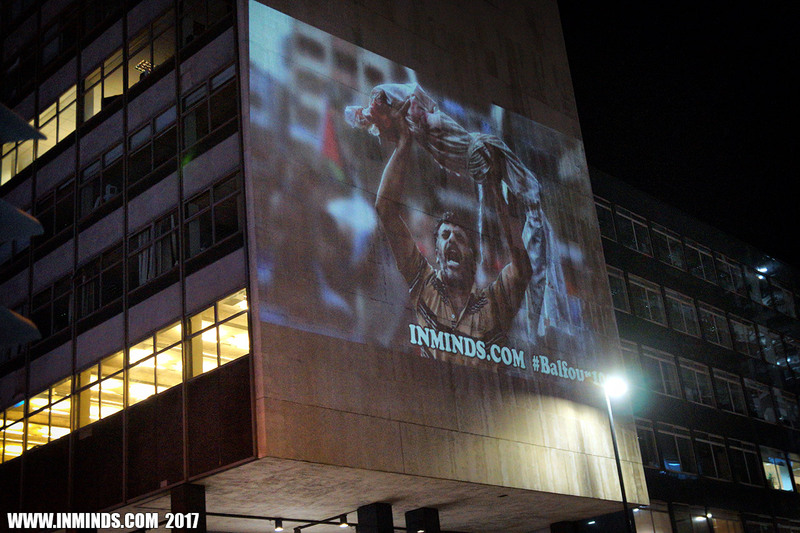 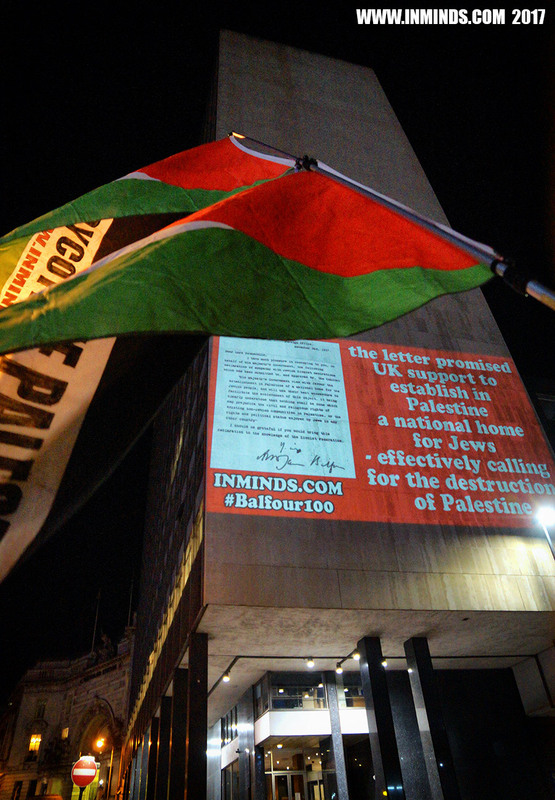 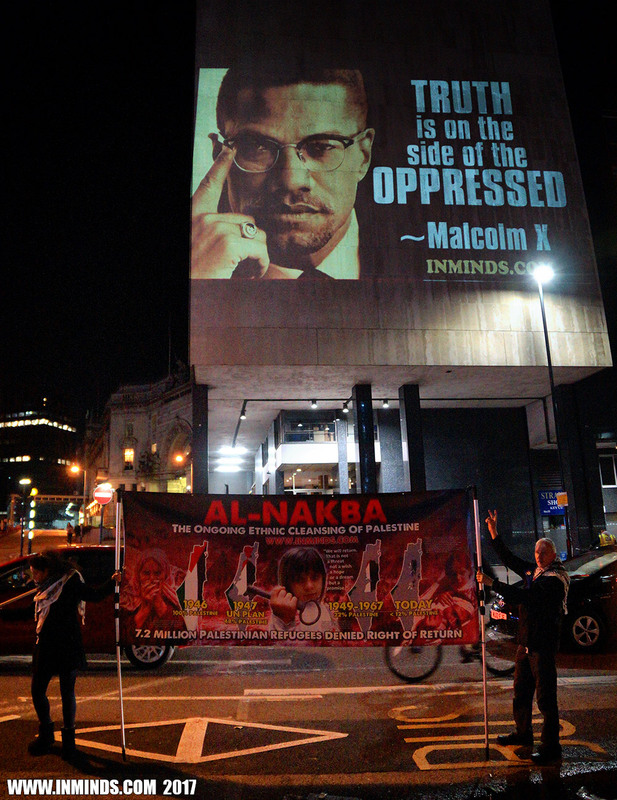 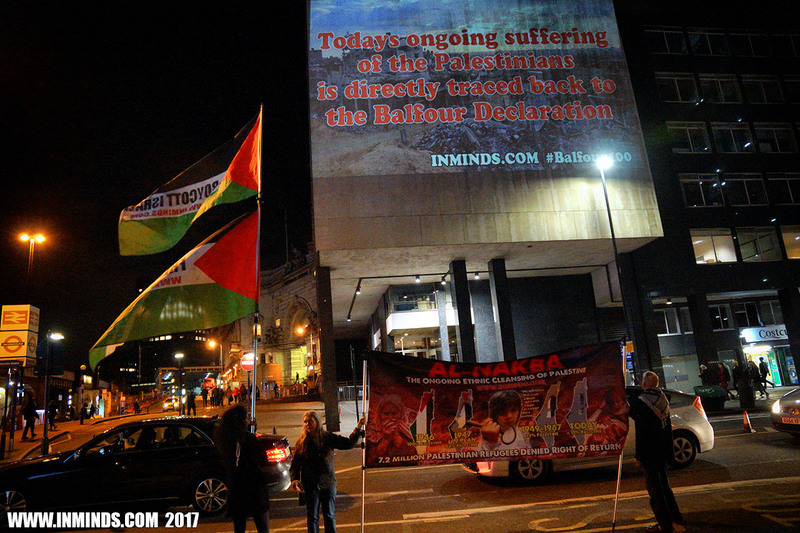 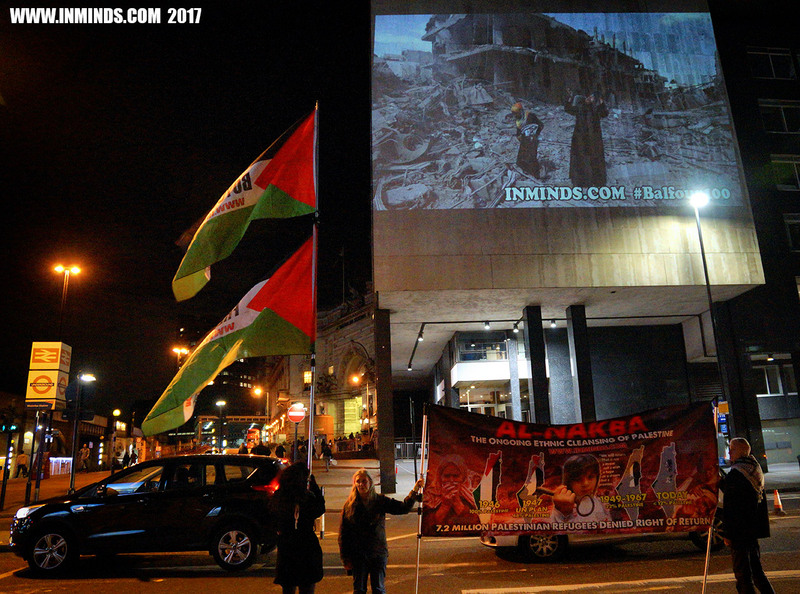 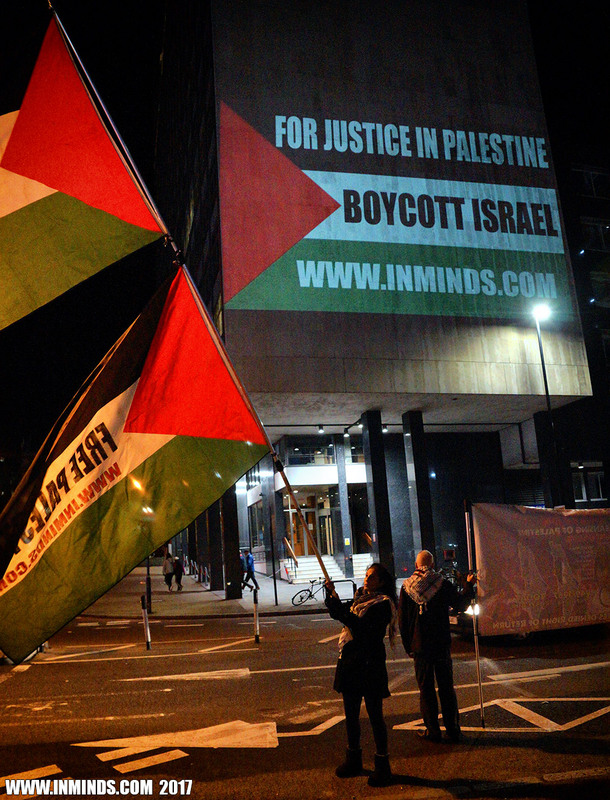 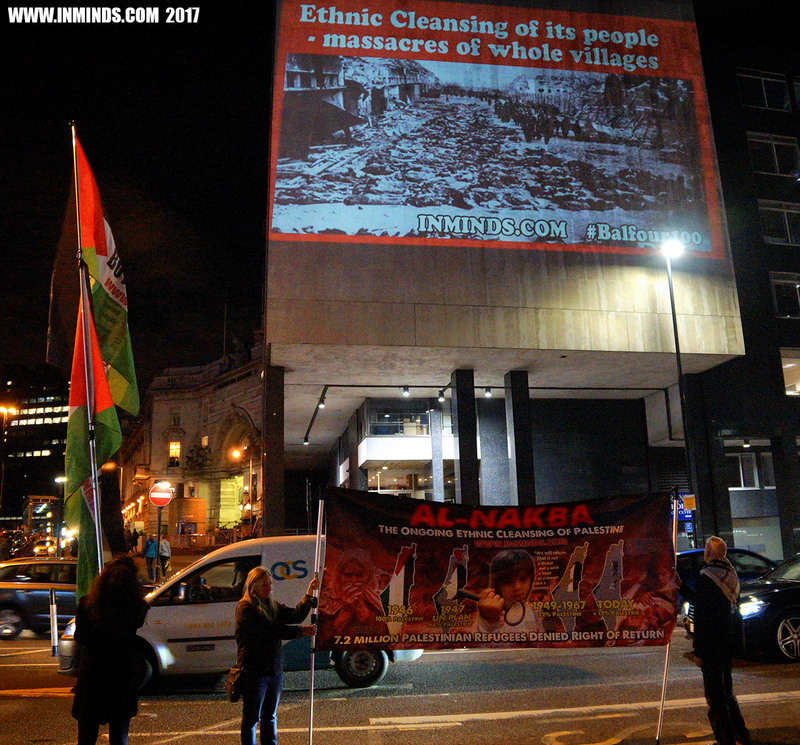 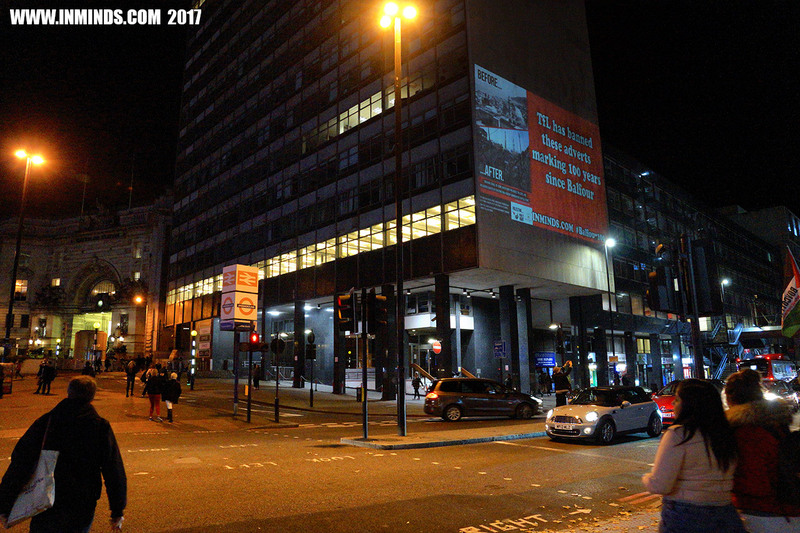 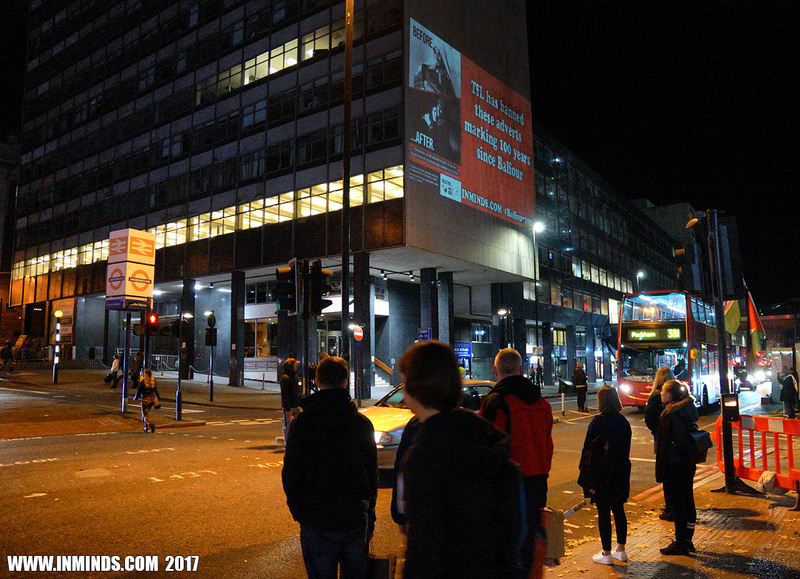 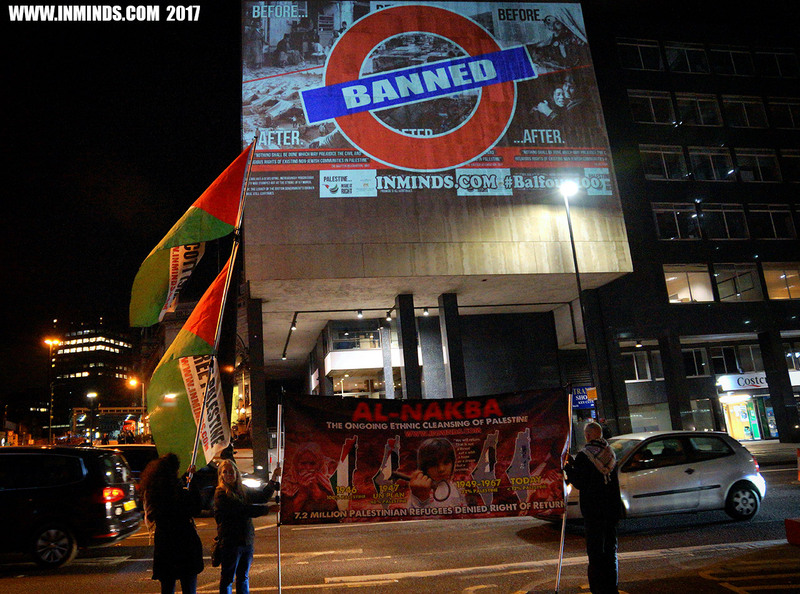 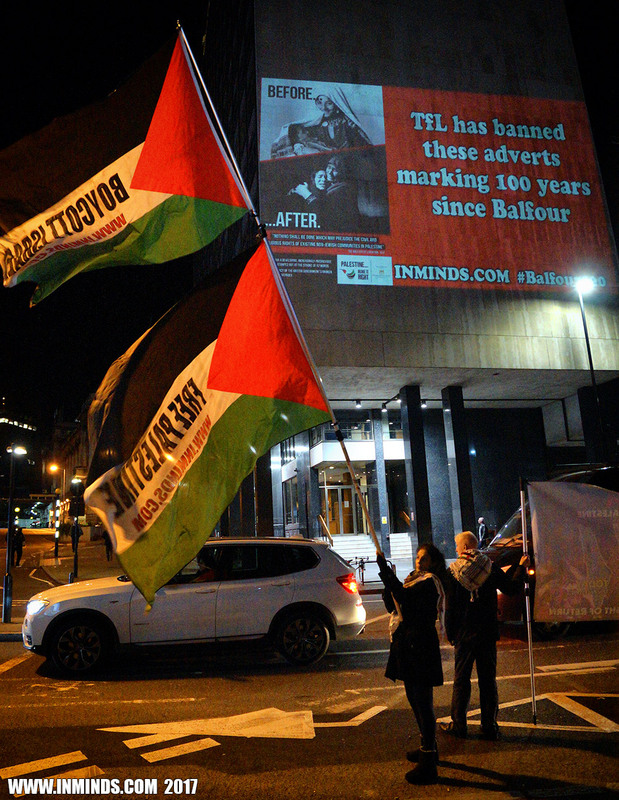 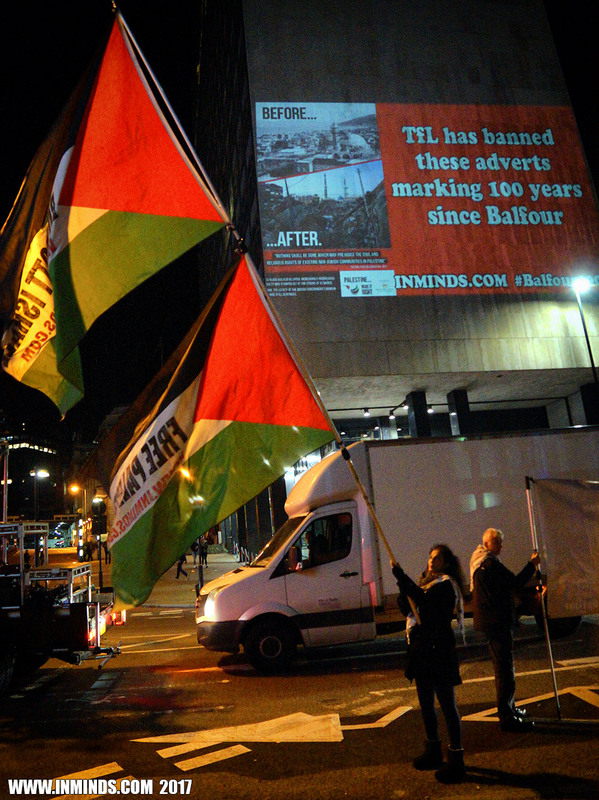 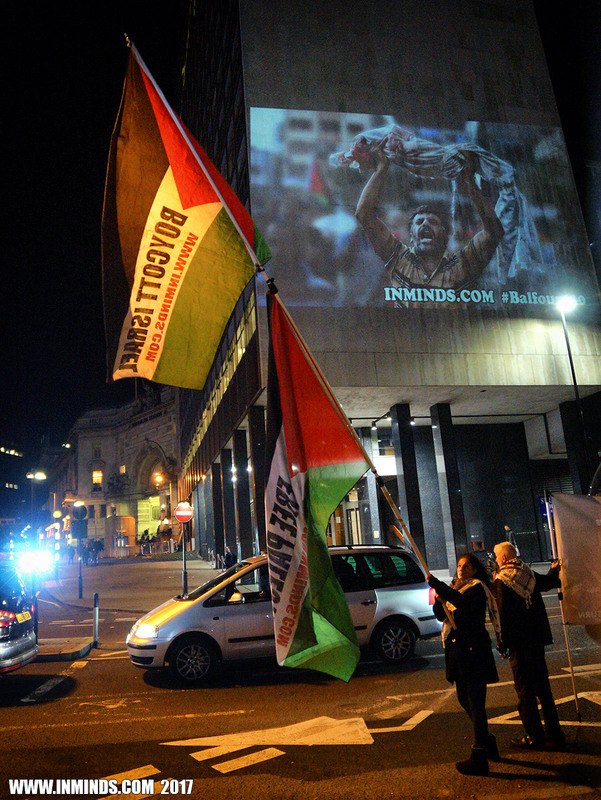 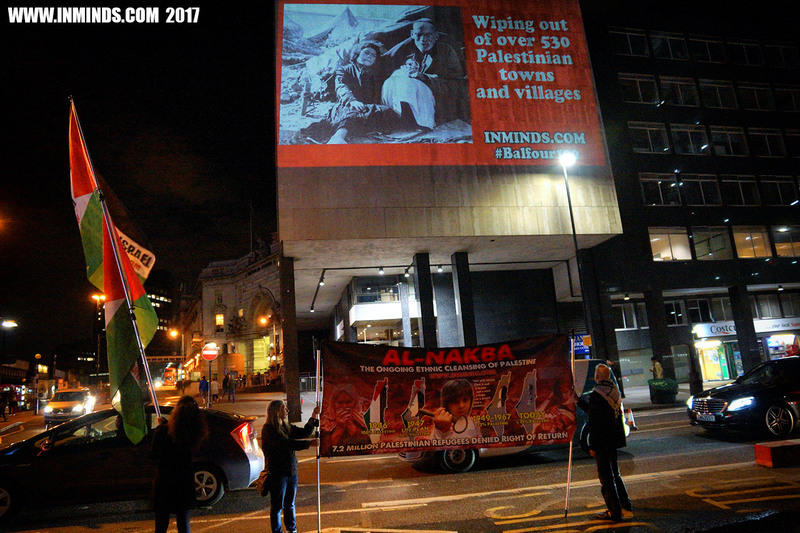 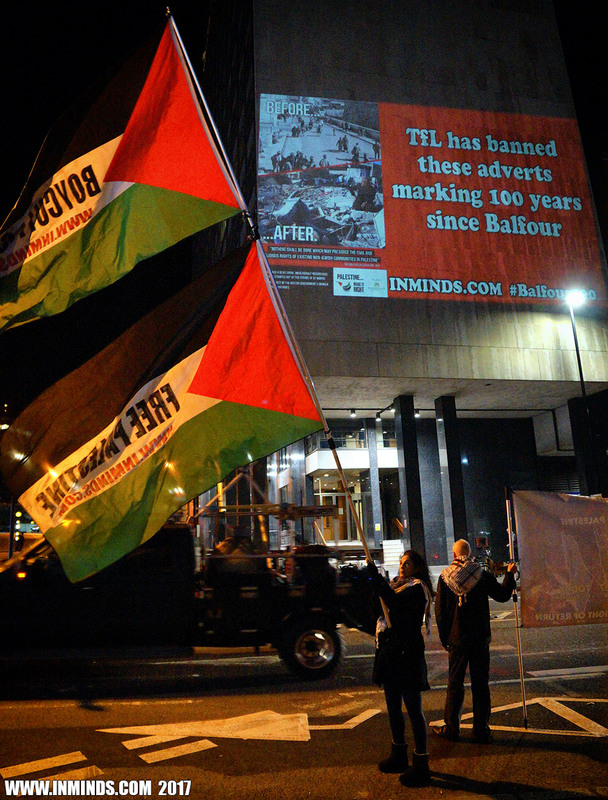 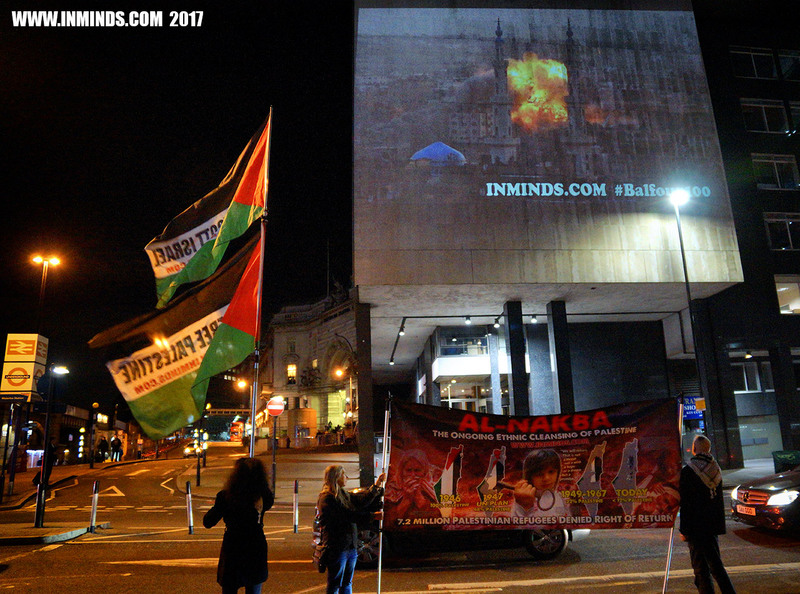 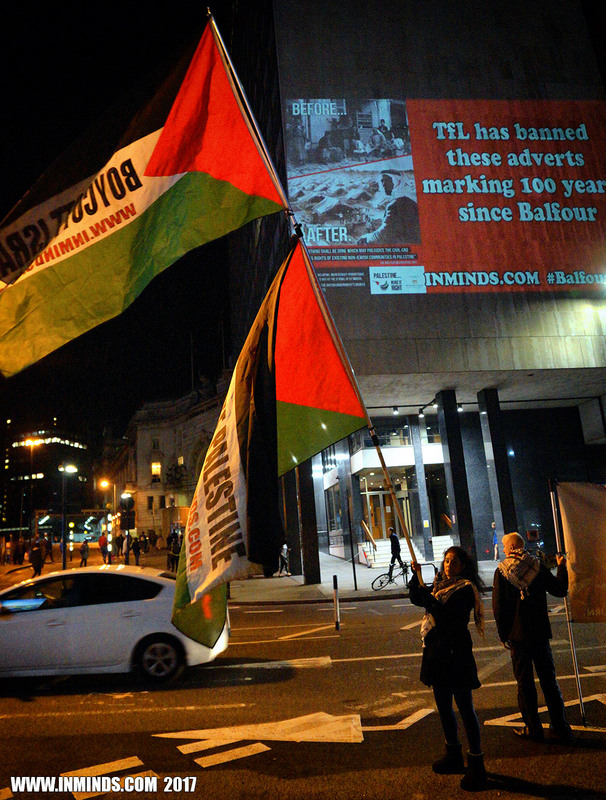 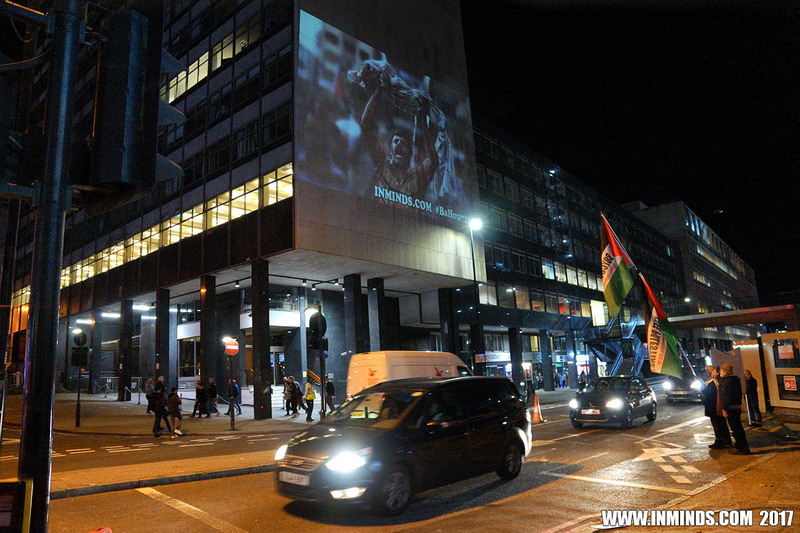 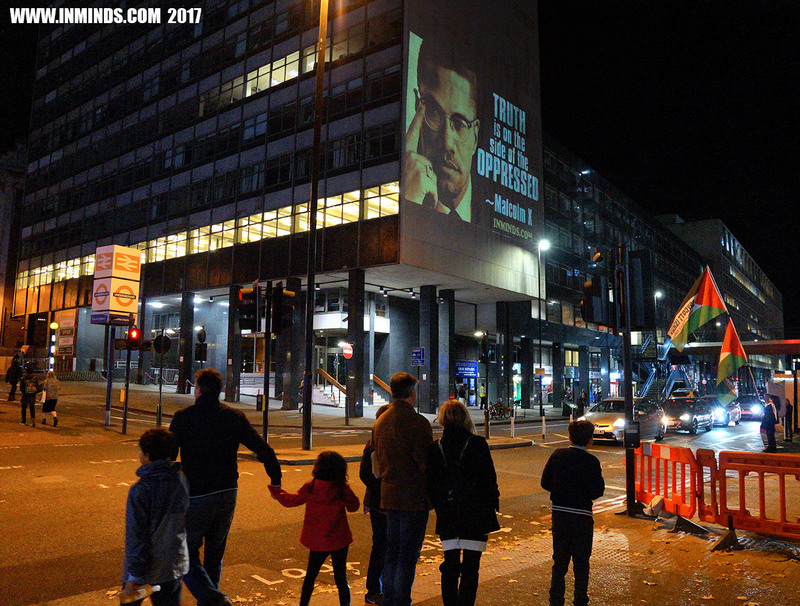 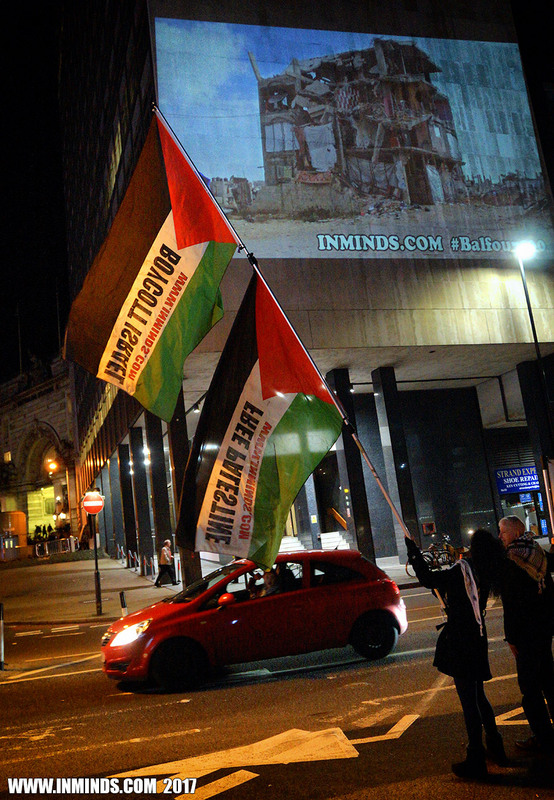 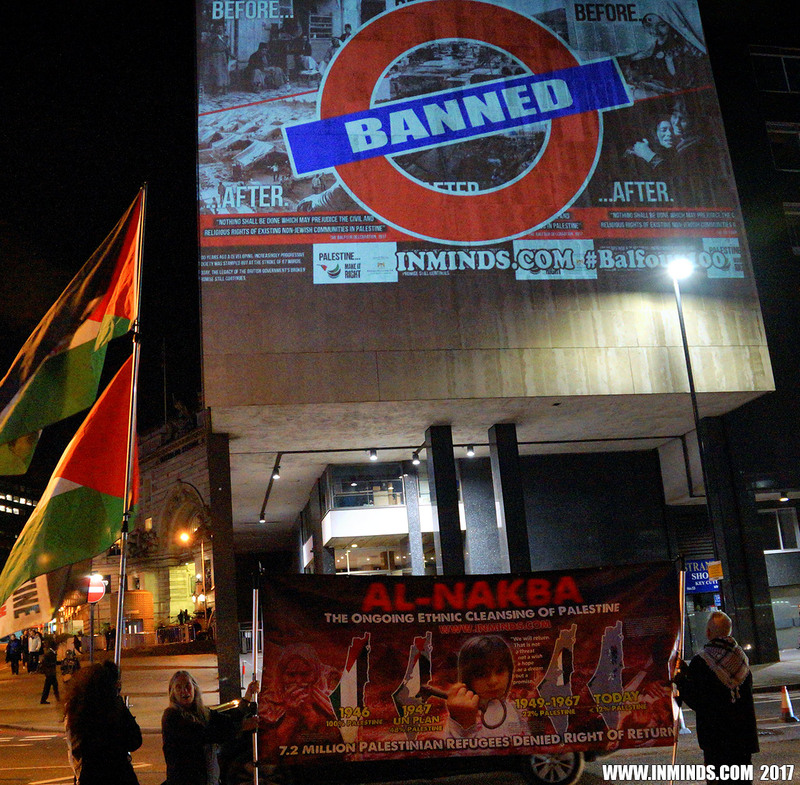 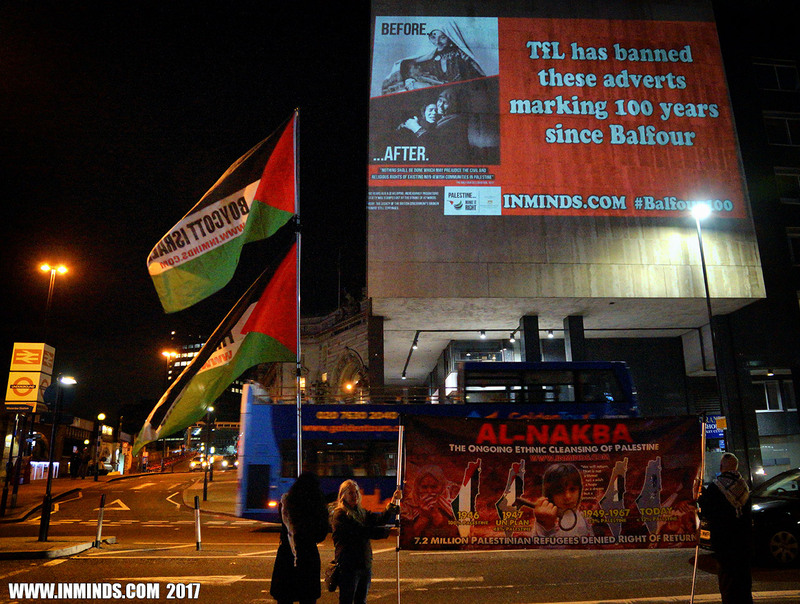 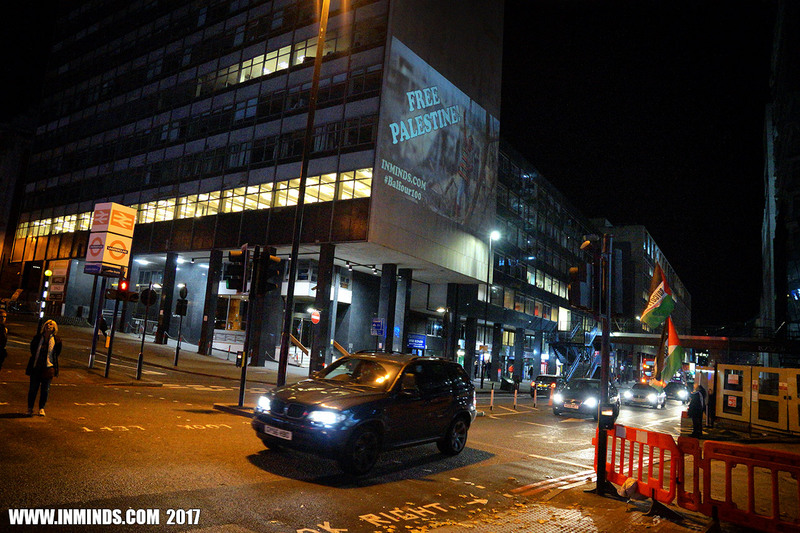 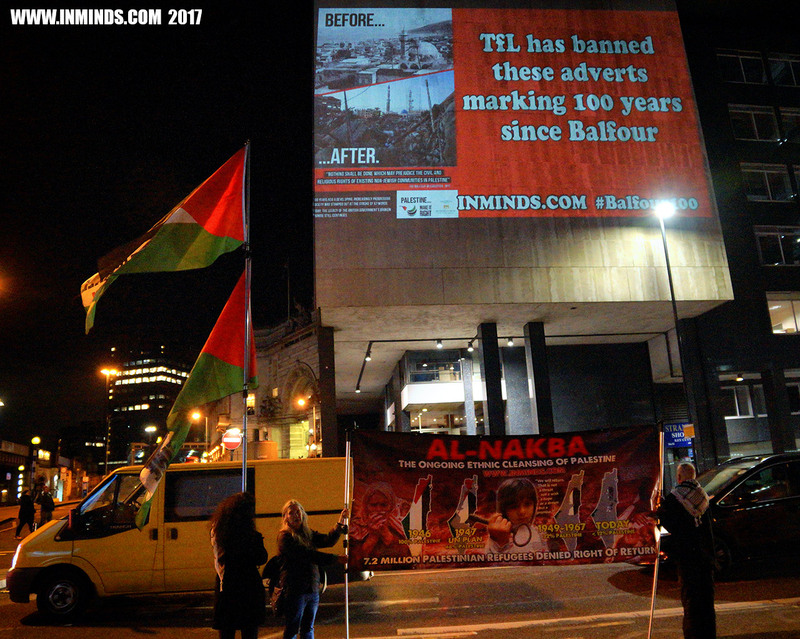 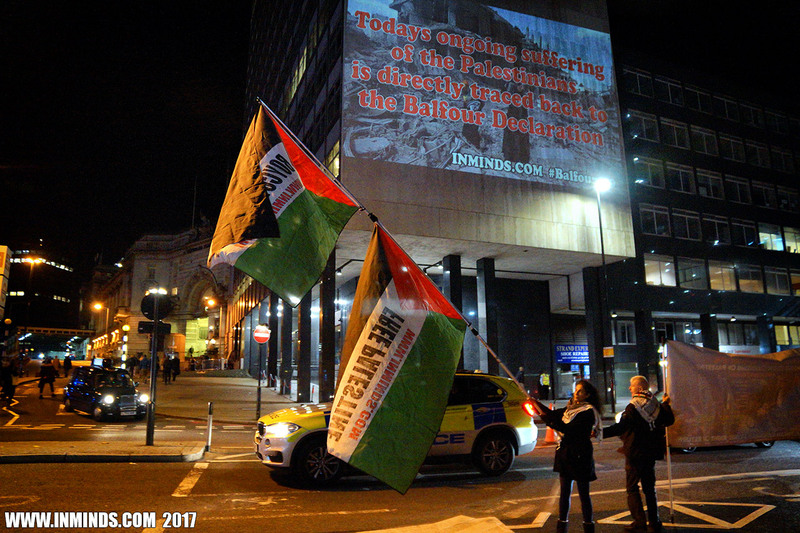 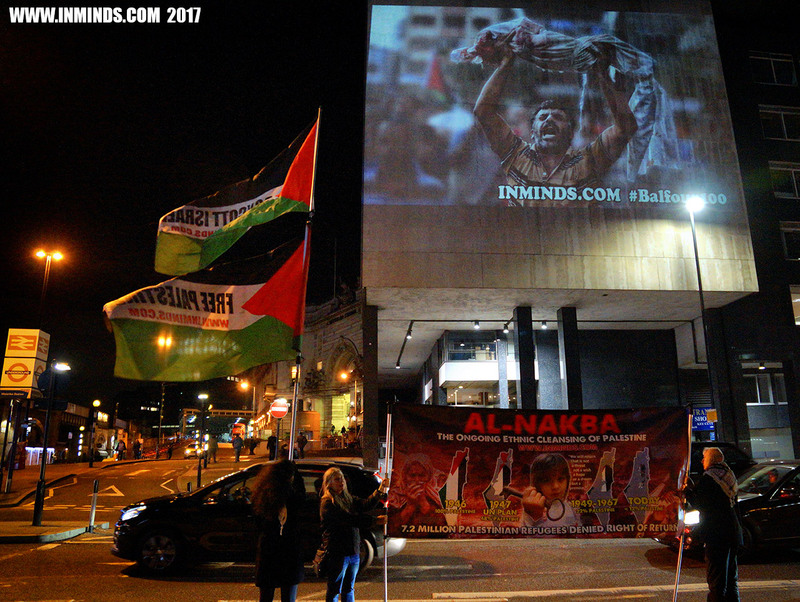 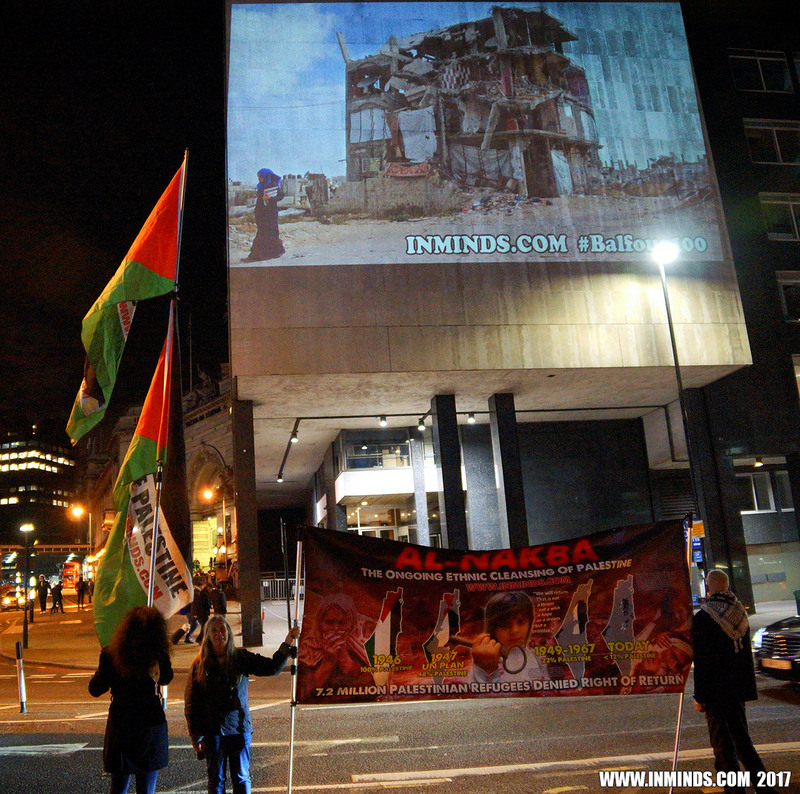 On 22nd October 2017, Inminds human rights group carried out a guerilla projection outside Waterloo railway station, the UK busiest station with more that 99.2 million people entering it and exiting it every year, to protest the UK governments Transport for London decision to ban paid adverts displaying Palestinian objections to the Balfour Declaration. 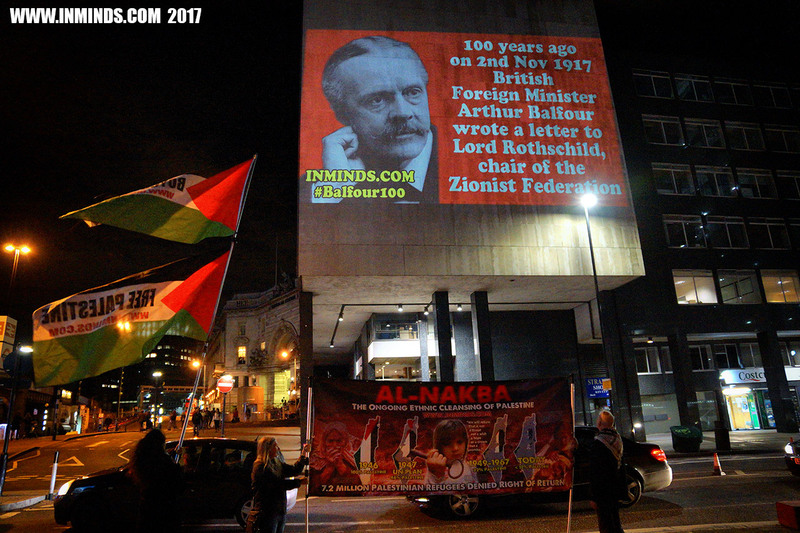 100 years ago on 2nd November 1917 British foreign Minister Sir Arthur Balfour wrote a letter to Lord Rothschild, chairman of the Zionist Federation, promising UK support to establish in Palestine a national home for Jewish people. 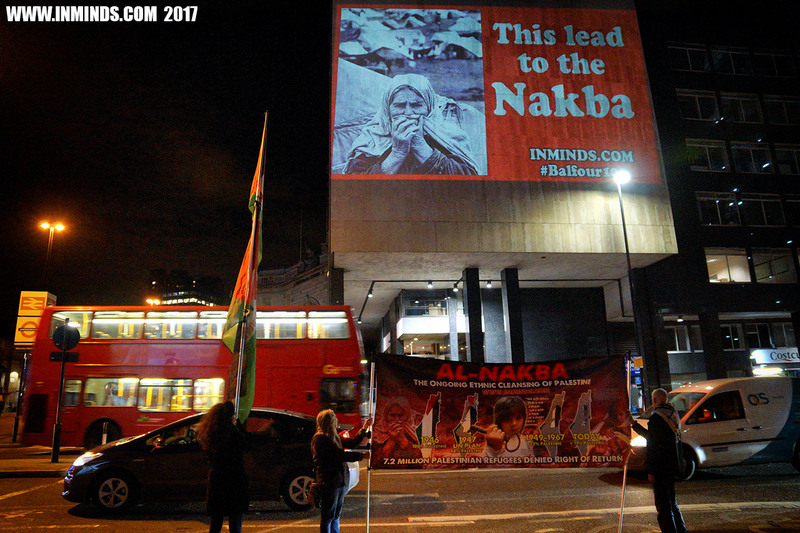 This promise and subsequent support lead directly to the Nakba, the destruction of Palestine with over 530 Palestinian towns and villages razed to the ground, wiped of the map. 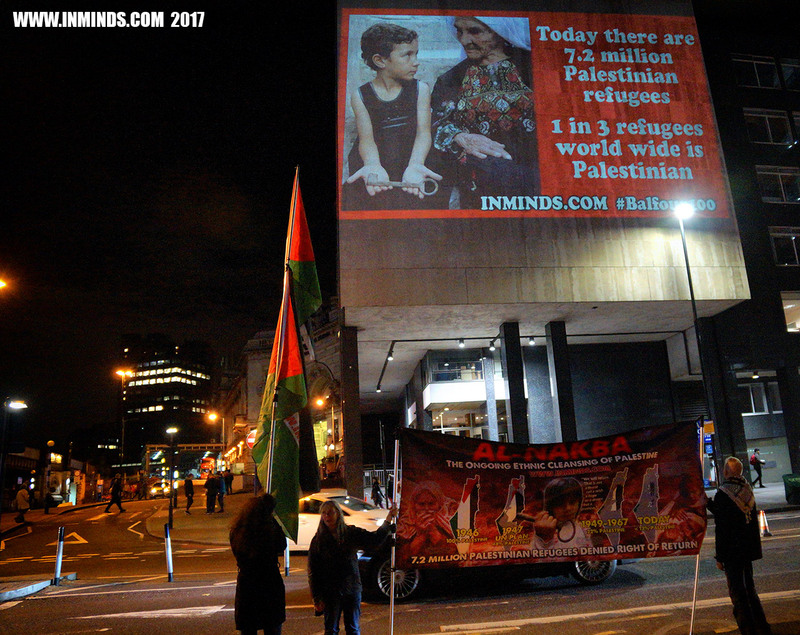 80% of the indigenous Palestinian population ethnically cleansed from their land through Zionist terrorism and massacres, scattered across the globe, rendered refugees - today they number over 7.2 million - with one in three refugees world wide being a Palestinian, they are never allowed to return to their homes. 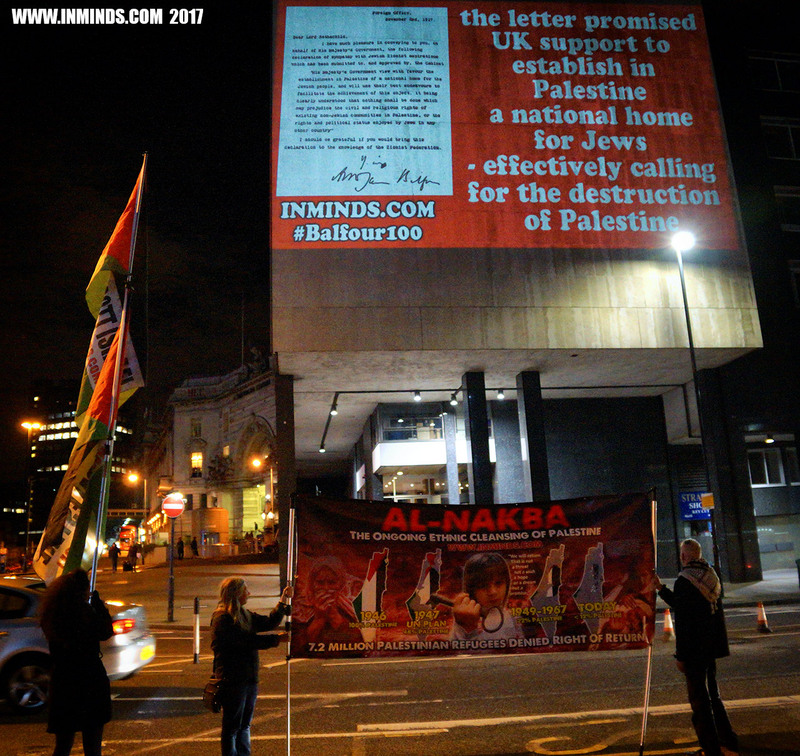 The continued ongoing suffering of the Palestinian people to this day can directly be traced back to this letter written in London 100 years ago. 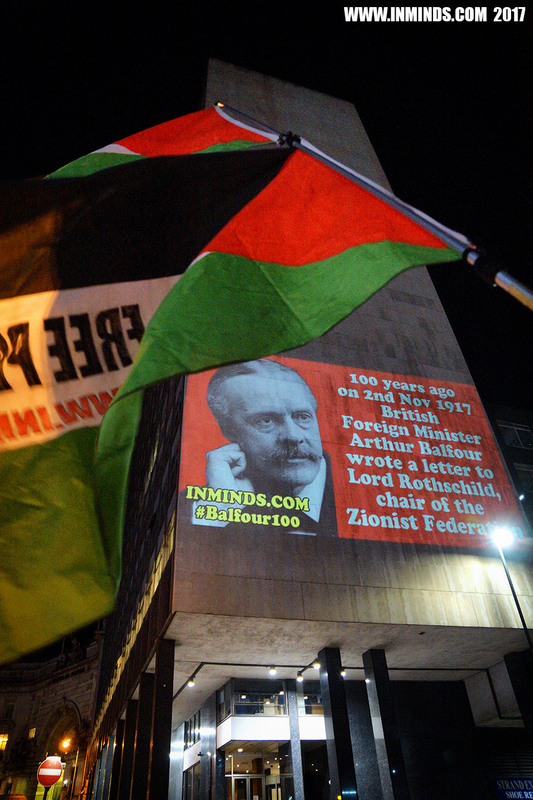 Inminds chair Abbas Ali said "The Balfour Declaration was a call for the destruction of Palestine, a green light for the ethnic cleansing of its people, and a license to steal their land. 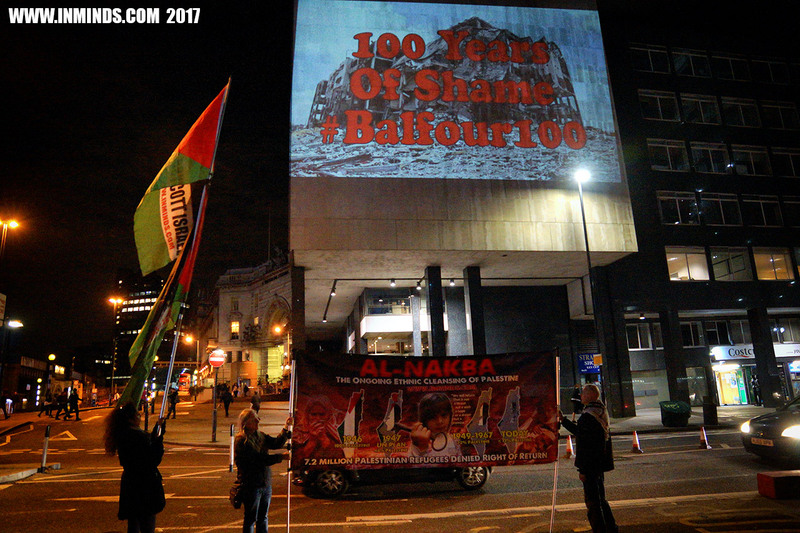 100 years on, the British government has done nothing to redress this crime. 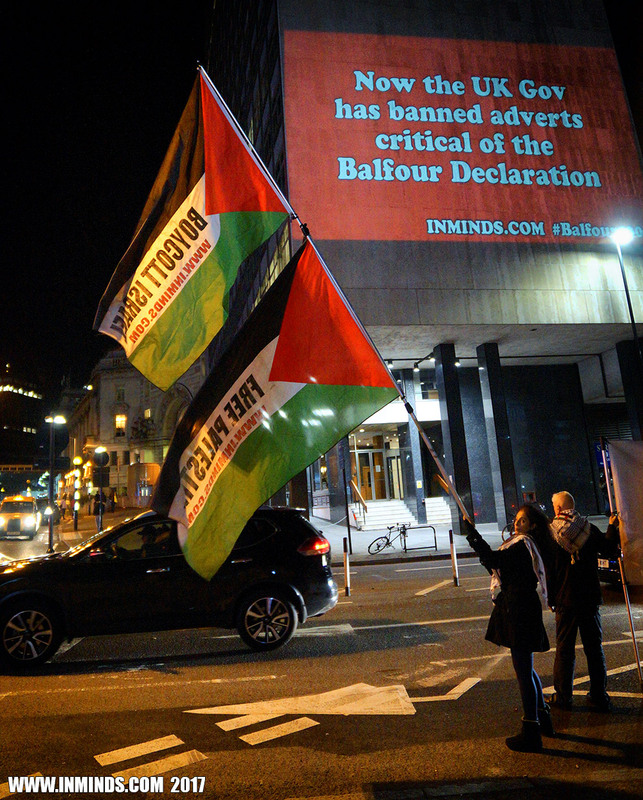 Rather than apologise for the Balfour Declaration, the government is celebrating it.. rolling out the red carpet to the war criminal Netanyahu. 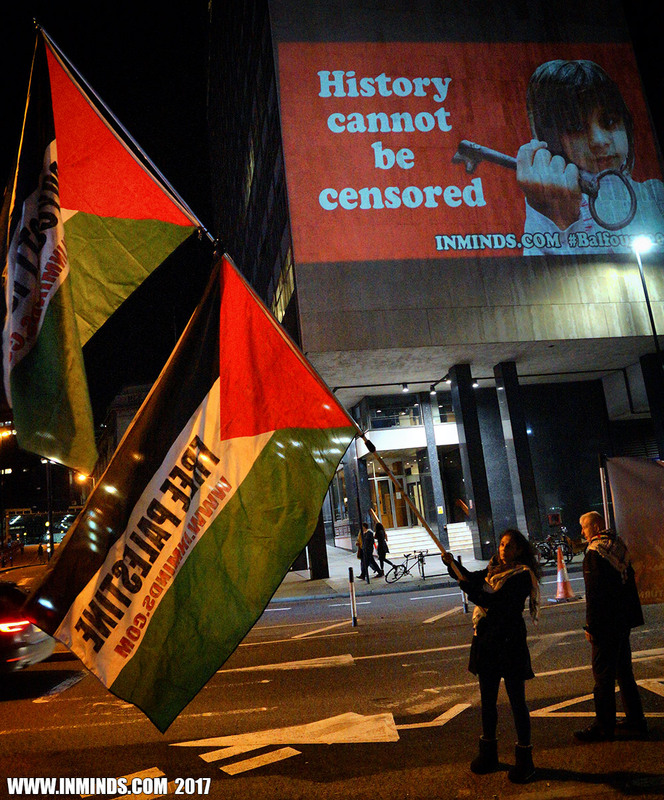 And now they are even censoring the history behind it. 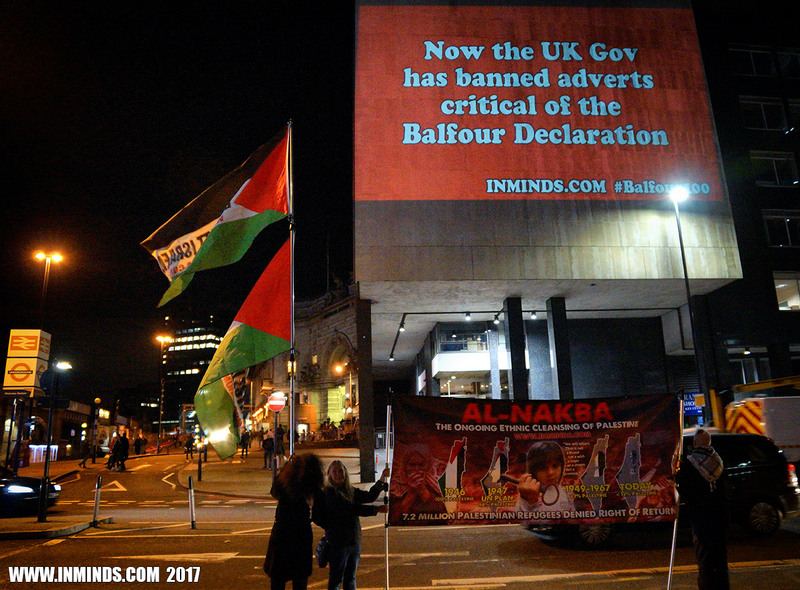 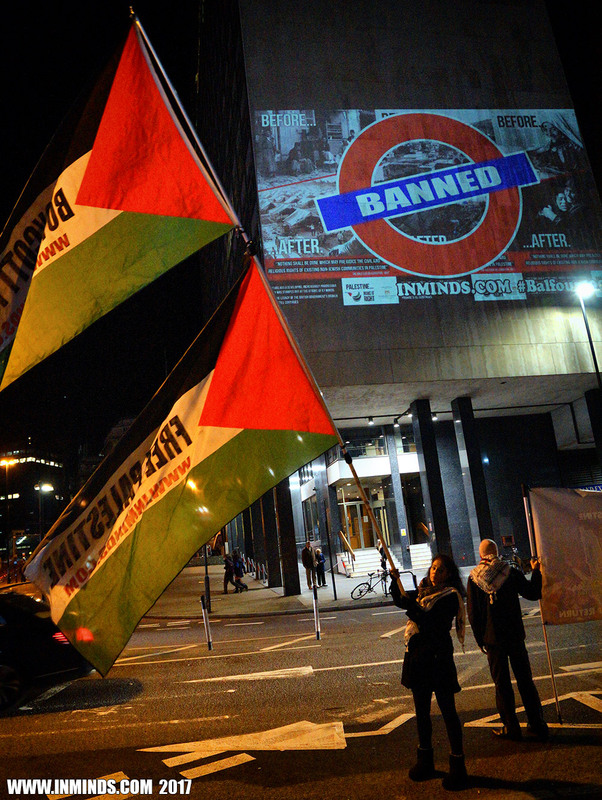 The governments transport division for the capital - Transport for London (TfL)- has banned paid adverts displaying Palestinian objections to the Balfour Declaration which were meant to be displayed across London tube stations to mark the centenary. 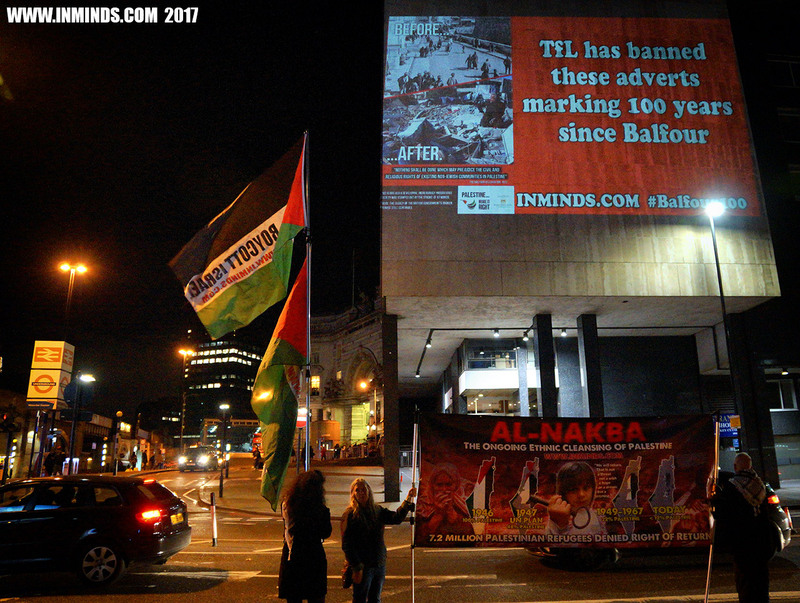 We are here to reveal to Londoners the history the government has banned, on the walls outside the country's busiest railway station." 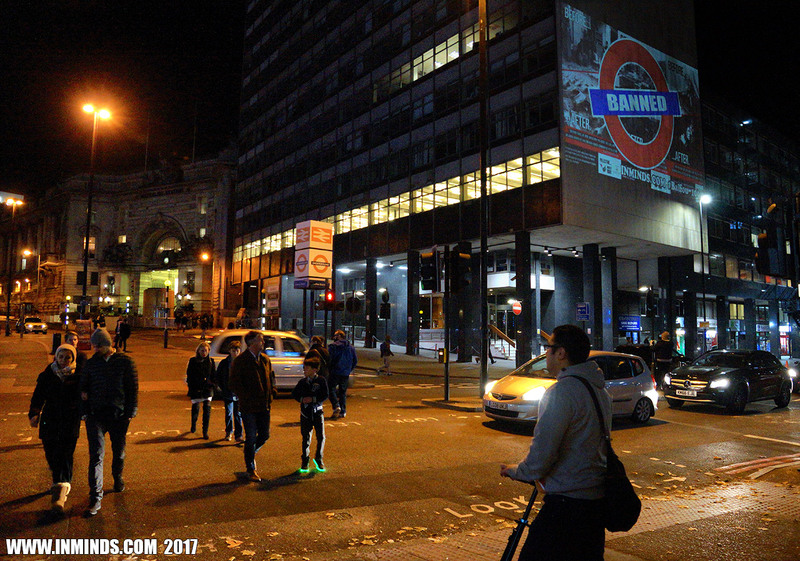 The projection was very well received with people taking time to read the slides and congratulating us for doing something about TfL's shameful censorship. 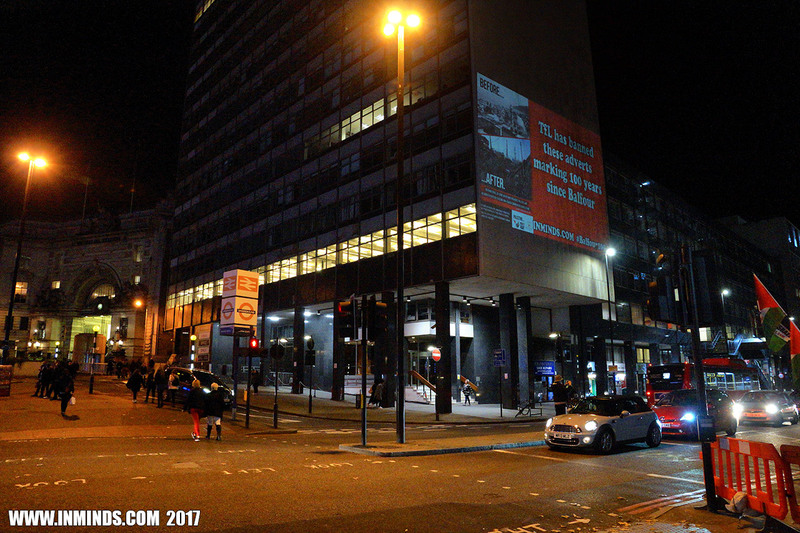 The constant steam of cars along York Road, all stopping at the traffic lights next to our projection, were also very sympathetic, showing their support with hoots and v signs from their windows. 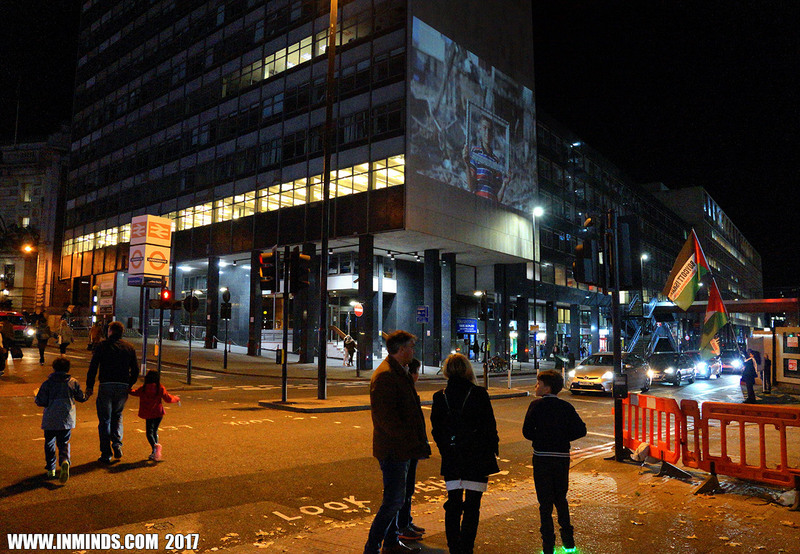 Building workers from the nearby construction also came out to watch the full slide show of 30 slides. 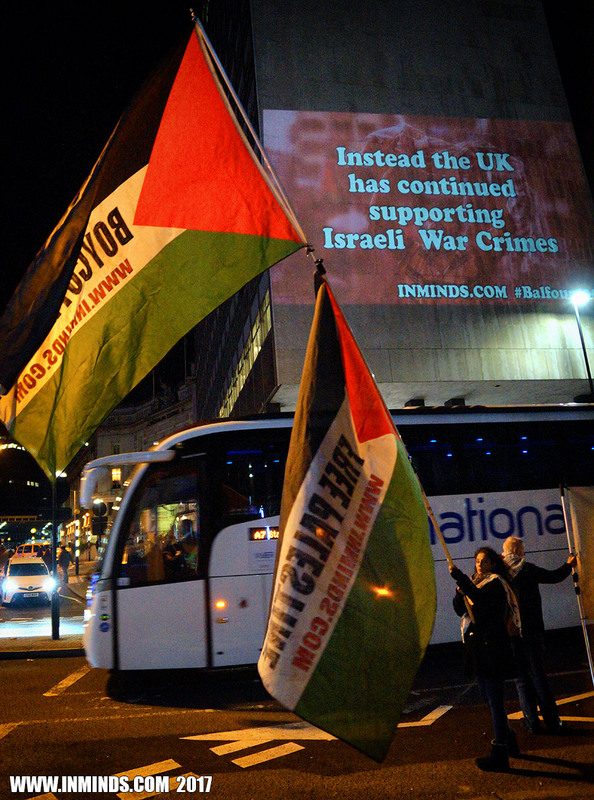 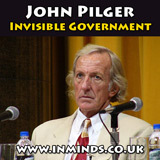 "Britain has unfinished business when it comes to Palestine. 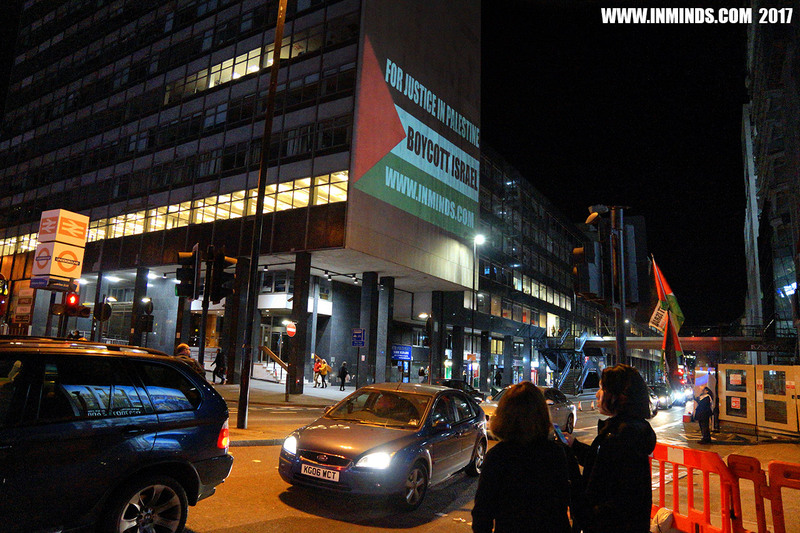 It has a legal and moral responsibility which must be acknowledged. 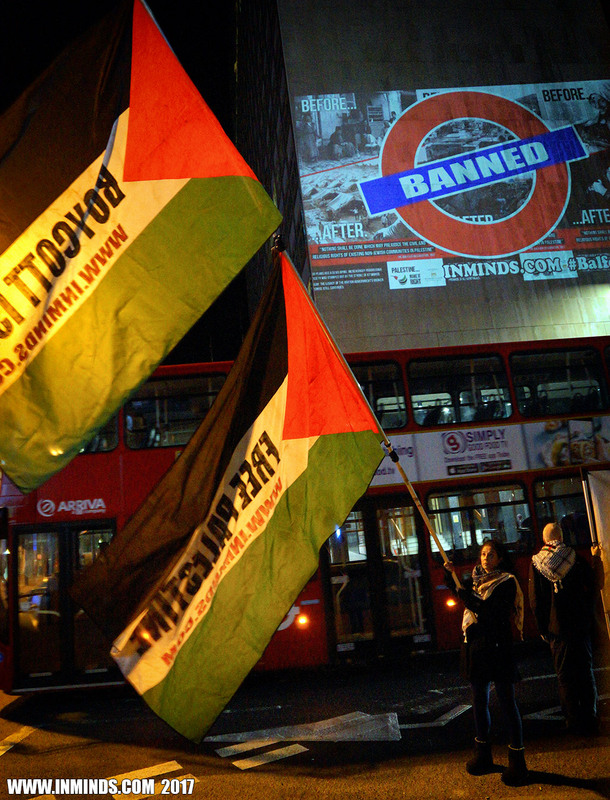 Restorative action must be taken to give back the Palestinians their basic rights and self-determination."